Would-be health care students at The Sixth Form College, Solihull visited Birmingham City University last week for a taster day in Diagnostic Radiography, Radiotherapy and Medical Ultrasound. The first year A Level Biology and BTEC Applied Science students started their visit with a brief introduction to the University, followed by a tour of some of its facilities with two of the current health care students. Students were able to see the library and some of their teaching resources, including an entire corridor set up to resemble a very life-like hospital. Following the tour, students took part in three separate workshops. They saw the 3D Virtual Reality Suite, where they were able to see radiotherapy on a virtual patient. They also went to the Diagnostic Radiography Suite, where two volunteers were able to try out moving the equipment on two volunteer patients. 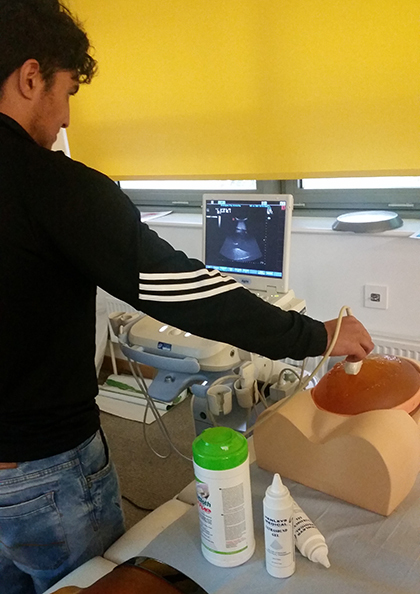 Finally, students learnt about the use of medical ultrasound and were able to practice on a model pregnant woman. “This was an excellent opportunity for students who harbour real ambitions to work in health care. The facilities at BCU are fantastic and very true to life, including the smell of the hospital corridor!